Did you ever read something that made you look around to see if there were hidden microphones or cameras nearby? Something that so perfectly encapsulated who you are and what goes on inside your heart and your head that you felt like it was written just for you? Something so insightful that you’re convinced you and the author are BFFs who simply haven’t met yet? If so, that was most likely content that resonated with your core values. That’s some powerful content indeed…and marketers know it. But if there’s one thing this election taught us, it’s that values can vary dramatically from person to person. And that people are often shocked and disoriented when they discover that the values they hold most dear just don’t resonate with somebody else. Or, if they do resonate, that they hold a very different spot on their list of priorities. What are core values, anyway? But, while we choose to align ourselves with certain values, we don’t consciously choose core values. They’re part of us….so innate that we don’t think about them. But they affect everything from what we buy and where we work, to whom we marry and how we vote. Our core values are the lens through which we view everything else. It’s a lot like Maslow’s hierarchy of needs — other values get your attention only after your core values have been satisfied. That’s what we saw with the 2016 election: It really wasn’t a matter of opposing values; it was a matter of shared values being prioritized differently. What were chosen values for some were core values for others, and that made a big difference at the voting booth. What’s that got to do with content marketing? Because content that talks to people’s values works. Values-based marketing has been around for a while, but the explosion of content marketing has given us exponentially more opportunities to practice it — from blog posts to LinkedIn updates to Tweets. All of that content can be designed to tweak certain core values. Not only does that strengthen your connection with your customers, it helps you spread the word, because people share, like, and comment on things that tell people who they are…things that reaffirm and validate their identity. It’s really the whole point of social media. So a values-based marketing campaign extends far beyond the original customer to include their friends, family, etc. In fact, values-based marketing campaigns garner 6% more social shares than traditional marketing campaigns. 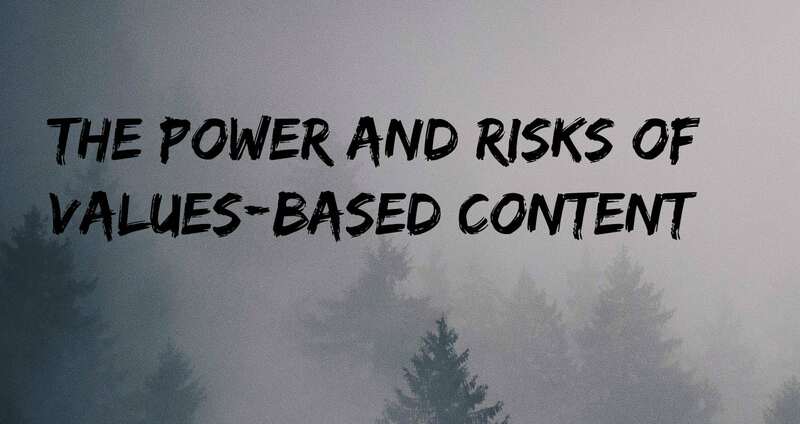 As powerful as values-based content is, content that does a great job of tapping into a certain value isn’t going to do you any good if that’s not a value that’s important to your target customer. In fact, it can create a disconnect that’s the complete opposite of what you were trying to achieve. Once upon a time I was attending a conference in Chicago with a bunch of folks from my company. At dinner one night, I ordered barbecued fish. I’ve always been somewhat of a foodie, and barbecued fish sounded new and exciting. Except that, when my fish arrived, there was no barbecue sauce. It was grilled fish. I still remember how disorienting it was to realize that there was a whole ‘nother definition of “barbecue” that was completely different from the one I grew up with and accepted as universal truth…kind of like finding out that people outside of the South breathe helium instead of oxygen. It was a very small thing, but it still forced a readjustment of my worldview. Content that targets the wrong values can be even more disruptive. There’s lots of information out there about what and how different groups of people think. I believe that it’s a mistake to take it too literally and conclude that everyone in the group fits the mold. However, data gleaned from properly conducted research can provide useful insights…as long as you keep the words “In general…” in the back of your mind. Preferably in big, flashing lights. This chart, for example, lists traits of Traditionalists, Baby Boomers, Gen Xers, and Millennials. As an overview, it’s probably pretty good information. But then you have people like me. I’m technically Gen X. But I don’t fit the model because I was a “tagalong” baby. I was raised by “Greatest Generation” parents who were the same age as some of my friends’ grandparents. They were kids during the Great Depression and came of age during World War II. Their core values — which they passed on to me — included hard work, self-reliance, accountability, personal responsibility, honesty, etc. And those core values are now so ingrained in me that I can’t separate them from who I am. It’s exceptions like this that skew everything and underscore why you have to take your data with a grain of salt. Typically, however, the more thinly sliced the research is, the more accurate it is. Spend 5 minutes on LinkedIn, for example, and you’ll likely see a number of posts on Millennials: What they’re like, how to market to them, how they’re impacting the workforce, etc. You’ll notice that my core values of self-reliance, hard work, and responsibility didn’t make the cut. That doesn’t mean that Millennials don’t value those things, just that they’re not a priority. And if you don’t understand that and work it into your strategy, your content will completely miss the mark. Bottom line: No generalization applies to every member of a group. But credible research can provide valuable insights to fuel a discussion with your team. Or, in other words, listen. Not just to the people in your life whose worldviews differ from your own. Listen on social media. Follow trending topics on Twitter, and pay attention to what Millennials (or any other target group) are saying about them. Read posts on forums like LinkedIn and Medium. And don’t just read the posts; pay close attention to the comments, too. (Trust me…talk about eye-opening!) Take note of the things that the people in your target market accept as unquestioned truth. Pay attention to which values they prioritize over others. Ask lots of questions, and really listen to the answers. Ping off of those insights — but do it subtly. The thing about core values is that you don’t have to explicitly point them out. You don’t have to say, “Hey, I’m showing you people who work hard because I know you value hard work.” It’s implicit. Your reflection of those core values resonates with people on a level that’s so deep that they don’t even realize it’s happening. Despite your best efforts, sometimes you’re going to get it wrong. Most of the time, your customers will forgive you if you fix it. They just want to know that you’re listening. Values are powerful, but they’re not one-size-fits-all. “Good” people can have strikingly different core values, and understanding that is critical to getting values-based content right. PreviousPublishing content on controversial topics: Risky or brilliant?